Funerals are, by and large, expensive. We have allowed the industry to goad us into frills and flourishes which contribute little, yet cost much. Having to finance one suddenly can be a burden that many, perhaps most, families are unprepared to face. Not coincidently, there is often a windfall of money at this time, in the form of life insurance proceeds, so families tend to consider that money ‘going away’ funds. The industry preys on this feeling that, since it was money the deceased arranged for to help ‘put him away’, every last dime should be spent on that event! The fact is, life insurance was never intended to be sucked up on a fancy funeral, but rather as a hedge against disaster for the survivors. Now that funerals routinely run up to, and over, $10,000 … the funeral itself can BE the disaster! Hence this section, so let’s look at the options for paying funeral expenses. Yes, there are some folks who can simply stroke a check for funeral expenses. Oddly enough, it isn’t the idle rich who get nailed with expensive funerals, as they are more inclined to have simple ceremonies following a ‘family-only’ direct burial or cremation. Look to ritzy Marin County, California for instance, where wealth is a foregone conclusion, and you’ll see that over 70% elect cremation. The big-dollar funeral is a blue-collar phenomenon, which is to say… most of us. Sociologists would have a field day explaining why this is, but survey after survey has proven it true. So, for most of us, ready cash is simply not an option. Credit cards, however, MAY be an option and even a good one at times. Virtually all funeral homes now accept credit cards, and if you’ve checked your mail lately you know credit card companies are hungry for business. And, with some of the competitive rates available today, you might well want to put funeral costs on a credit card — say at its ‘introductory rate’ of 0%-9%, rather than leave a balance on the books at the funeral home (which charges 12% or more APR on any outstanding balance) while waiting for the insurance proceeds to arrive. This is also a good way to keep your insurance benefits out of the hands of the death industry. This is a common way of handling expenses, and a tricky one if you don’t understand how it works. What happens is, you bring the deceased’s insurance policy with you, the funeral director calls the company to make certain it is still in force and will pay a benefit, then you (the beneficiary named in the policy) sign forms granting the funeral director all or a portion of those benefits. This is where it can get tricky, you should never sign away any more than the good-faith estimate provided by the funeral. Funeral directors sometimes want to take control of the entire death benefit, then keep their portion and return the res… if any… to you. You may encounter this ploy, particularly if you let the funeral home handle the cemetery fees as well. Say you get a bill for $8,600 and the itemized bill for the funeral portion is only $4750, what do you know about the rest of the charges? Nothing! Since cemeteries are not regulated by federal law, or required to furnish detailed lists of charges, the funeral director can simply list Cemetery Costs – $3,850 and leave it to you to ferret out what it was all for. If this sounds like an invitation to abuse and over-charging congratulations, you’re learning. Handle the cemetery yourself, preferably in advance, and with the minimum allowable outer container. These sound like a good idea, but rarely are the way they are operated by the funeral industry. They hype the peace-of-mind that comes from knowing your family will not have to shoulder a financial burden when you die, yet very rarely follow through on that. It is a rare pre-paid funeral that includes all costs, with the family typically having to pony-up an additional $1,000, $2,000, or more. It is also rare for a payment plan offered by a funeral home to be anything more than reselling an existing product with an extra layer of profit thrown in. For your best value, get your insurance from an insurance company and cut out the ‘middle man’. A built-in problem with all funeral expenses, and what drives prices into the ludicrous range, is what is known as ‘up-selling’, and this is due to funeral sales people (laughingly referred to as ‘Grief Counselors’ in the trade though they cause more grief than they help with) being paid commissions on their sales. It is not uncommon for these sales folks, and cemetery sales personnel as well, to call up their elderly customers who have pre-paid for goods and services and, under the ruse of updating their computers or whatever, get them to come by to verify information. Then they are hit with a hard-sell to upgrade their goods and services. One sales person told us he closes over 40% of these calls. An extreme example of up-selling occurred in Florida a while back and made the news again recently, wherein an SCI-owned funeral home had up-sold an elderly lady funeral goods and services totaling $136,000! The victim of this is still alive, living in a nursing home, and largely oblivious to what had happened to her. The family sued, SCI settled out of court for an undisclosed amount, and hopefully folks who read the Associated Press account are a bit wiser. Now on to the various pre-need/pre-purchase plans. 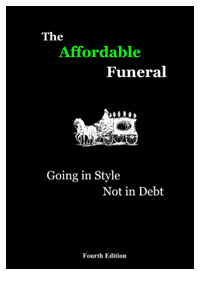 The Affordable Funeral goes into detail on these plans, with a break-down of the common ploys, half-truths, and outright lies associated with them, and you are well advised to read up on any plan before you buy, and for certain if you have already bought one . . . to learn what it is you actually purchased. For our purposes here, we’ll look at the typical plans offered. Quick, would you go to a McDonalds to buy a pizza? No? Then why on earth would you buy an insurance policy from a funeral director? Typically these policies are little more than a policy offered by another company, to which the funeral director adds additional premiums, names himself as beneficiary, or buys at a discount. Read The Affordable Funeral for the low-down on some of these you’ll have seen on TV or received in the mail, but be wary of those that offer ‘coverage to anyone up to 80 years of age!’ or something similar. Odds are there are restrictive clauses that will limit the actual pay-out of these policies for several years, and perhaps forever. If you are paying premiums and only stand to get back the total of those premiums, you are just giving someone else money to invest for their futures, not yours. So, you may be asking, what should one do? Simple: go to the source. If you want an insurance plan to cover your burial expenses, call your insurance agent or broker and add to an existing policy or buy one for enough to cover expenses. Realize that funeral costs historically escalate at a rate nearly triple inflation, so don’t settle for what it would take to handle things today, pad it and hope for the best. TRUST is a great word. You see it on coins, investment companies, and banks. It has a solid feel to it, and that is the intention, to make you … well … trust whoever wants your business. Funeral directors love trusts as a prepayment instrument for several reasons. First, they are easy to sell because they sound like a great deal. You pay in money, the money goes on deposit in an interest-bearing account, and when your time comes, voila! the trust is there to defray funeral costs. That’s how it looks on the surface anyway. Now for the bad news. In many states, not all the money you pay in actually goes into an interest-bearing account. In fact, in some states as little as 60% is required to be put on deposit, plus the funeral director is allowed to keep 10% or more as ‘Administrative Fees’, so now you’re down to perhaps 50% of your money actually working for you. The rest is working for the funeral director. Add to this the fine print which may say the funeral director can keep 30% or so of the total paid in, should you decide to cancel the program and ‘cash out’ the trust, and you’ll see that perhaps the funeral home sold trusts are not much good. They certainly bear looking into in any event, and having someone knowledgeable go over it with you … other than whoever is trying to sell it to you. Another built-in problem is continuing payments. There may be a clause to the effect that, should you miss three payments in a row, the trust can be locked, with the interest acrued or even the principal going to pay the funeral home’s ‘administration fees’. A recent case in Virginia points out what CAN happen, and often does. A family lost their father, who died at a nursing home after three years as a resident there. They made the obligatory trips to the funeral home, to pick out the casket, floral sprays, burial vault, etc … and to the cemetery to arrange for the burial. At both stops they were gratified to see on the ‘good faith’ estimates no totals, but rather the words “Pre-Paid” written in pen across the balance block. Then came the bad news. At 9:30 the morning of the funeral, which was scheduled for 11:30, the funeral home called to say there was a problem and could family members please come immediately. Turns out, according to their records, that the deceased had not made a payment on his pre-payment plan since 1990, the year he had suffered a stroke and lost many abilities! Since the deceased had already been placed in an up-scale casket (the model the deceased had picked out), they had no choice but to buy it. They managed to scale back a bit on services not yet rendered, but still left the funeral home with a bill for over $6,000 and NO MONEY in the trust to help pay it. Then, upon arriving back home, they found a message to call the cemetery and found the same situation there. Oh, and perhaps not coincidently, both the cemetery and the funeral home are owned by the same giant corporation! The family is considering a law suit, and we wish them luck. So, is there anything we DO recommend? Yes, the Totten Trust. This is a simple little account you set up with your bank. You pay money in, 100% of it goes on deposit and you get to keep ALL the interest acrued. Should you decide at a later date that you prefer cremation, you can draw the money out . . . all of it if you like . . . with no penalty. Should death occur, the family controls all the money in the trust, including any left over after funeral expenses are paid. Talk with your family bank and/or lawyer on how to set one of these up. A word of caution, often the ‘demonstration’ the funeral home gives you on their trust-based program will show an average earnings of several percentage points MORE than you’ll get with a Totten Trust through a bank. Don’t be fooled by this. Consider that perhaps only 50% of your money will actually be earning interest, and the ‘administrative fees’ will likely be based on what you have paid into the trust PLUS interest earned and at the end of the year, with the funeral home plan. Taking these into account, plus the 30% forfeiture should you cancel the account or become unable to make the payments, the Totten Trust will likely be your best buy. It is a fact of life that some people will die without sufficient resources for funeral expenses. Our society anticipates this, to some degree, so most major cities set aside a budget for the burial of indigents, homeless, or basically poor individuals. Likewise, MediCare/MedicAid has provisions and programs in place to assist qualified individuals in getting a decent burial. Some churches have funds for this, and there’s the United Burial Fund which can help with some cases. Ask around at your city and state govermment offices, as well as churches to see if such funds are available if you have need for them.